"Women and Children are the most marginalized groups in relation to health." If children are treated homeopathically since their birth, they can be saved from different chronic and complicated diseases and bad effects of different chemical drugs. 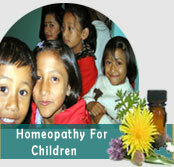 Use of homeopathic medicines for different illnesses helps to improve the immunity of children. Apart from other general illnesses, complaints during dentition period and recurrent conditions like Tonsillitis, Infantile pneumonia, Chronic Dysentery, Allergic and Atrophic Rhinitis and common colds can be cured with its recurring tendency. Women can be helped to a great extent by the help of Homeopathic treatment for the complaints, which appear during the “Physiological Changes of Life”. Puberty / Menarche: acne, late menarche, menstrual disorders, goiter etc. During pregnancy: indigestion, nausea, vomiting, hyperemesis gravidarum, APH, tendency to miscarriage, chloasma, eclampsia, pre-eclampsia etc. Abortion can also be performed safely within the eighth week of pregnancy. Parturition: difficulties during delivery due to rigid os, less uterine contraction etc. Puerperium: prolonged puerperium, PPH, PPD (post partum depression) etc. Menopause: headache, palpitation, hot-flushes, menstrual irregularities, psychological disorders etc. Apart from other gynecological and general disorders certain surgical conditions like Tumors of breast, Ovarian cysts, Uterine Fibromyoma, Bulky Uterus, Hydatidiform Mole etc can be treated successfully without performing surgery.